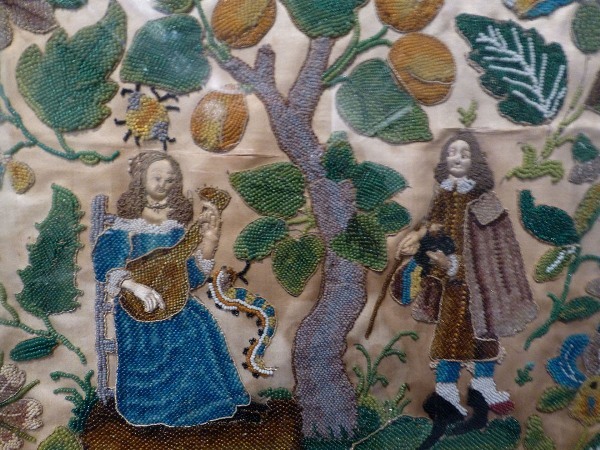 Adam and Eve in the Garden (17th century English). Drawing on its permanent collection, Hastings Museum presents an exhibition comprising an eclectic selection of ceramics, design sketches, still life paintings and botanical illustrations inspired by plants. Roz Cran went to take a look. Flowers, even the word makes me smile, so I knew I was in for a treat as I entered the first room of The Nature of Things: Plants in Art at Hastings Museum and Art Gallery. A colourful mixture of flower paintings greeted me, as well as porcelain flower heads in glass cases, a small figurine Flora covered in flowers, a wooden panel carved with flowers and leaves, fireplace tiles decorated with tendrils, embroidered Native American gloves, two Japanese copper mirrors, fabric designs, cases of branches and tree cuttings and a sewing box inlaid with floral mosaic. “It’s a bit like Spring,” said the other visitor in the room, and the air did seem lighter and brighter compared with the damp and dark weather outside. ‘Adam and Eve’ begin the show. They are sewn with turquoise, gold and green threads and beads onto silk. Eve is seated and plays a lute at one side of the Tree of Life from which hang huge golden fruit, the serpent appears to dance to the music. Adam stands on the other side looking bewildered, and holding the bags. 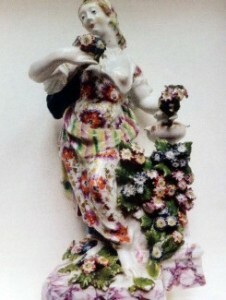 Figure of Flora on a square base (Bow Pottery, c 1760). Flora stands firmly on her small square base but wears a wan expression. To either side of her are two more ceramic figures representing Earth and Water (circa 1765), both have candle-holders. Selection of flowers (porcelain, Derby, 18th century). 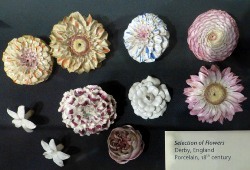 Next to catch my eye was a group of flower heads made of porcelain. They took me back to being a child, pulling heads off flowers, entranced by their prettiness. I’d like to hold them in my hand. I’d give gold stars to two paintings because they made me giggle. 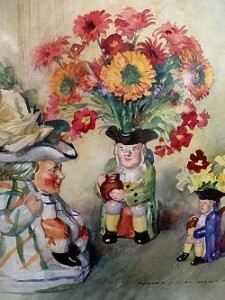 The Three Tobies (1933) – a set of Toby jugs with flowers sprouting comically from their heads, and The Rival Parrots and Anemones (1929) who seem to be vying for the top position. They were painted in watercolour by EJ Sullivan. This Mrs, Miss or Mr Sullivan died in 1933 aged 64, a person with a quirky humour. The Three Tobies, EJ Sullivan (1933, watercolour). 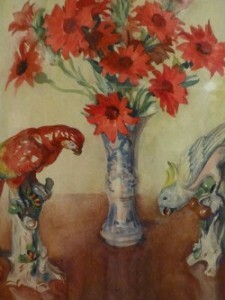 The Rival Parrots and Anemones, EJ Sullivan (1929, watercolour). Fabric design, detail, Margaret Lewington. Margaret Lewington (died 1971), illustrator and designer, has a whole glass case to herself. There are decorated music covers, fabric designs, a calendar, watercolours, clearly an extremely competent worker across media. 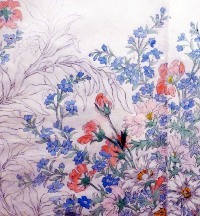 Here is a detail from an unfinished fabric design. Of local interest will be a dark brown oil of a hop garden in Alexandra Park (who knew?) by Charles H Graves who lived until 1918. Also the fashionably blurry Flowers in a Vase watercolour painting by the fantastically named Hercules Brabazon Brabazon; a selection of pots from the distinctive Rye Pottery, brown-ware with green and yellow glazed leaves circa 1875; also plant drawings taken from the 18th century diaries of naturalist William Markwick, including the foxglove, black horehound and the common barberry. My favourite object was a small white jug of thin porcelain in the shape of an acanthus leaf made about 1745 by the Chelsea Pottery. This was not a challenging show but an enjoyable and cheering way to spend an afternoon exploring this selection of paintings and objects from our own Museum’s collections. Afterwards I wandered through the Museum and everywhere I looked were decorative leaves and flowers and animals. Flower motifs were carved on the panels of the Durbar Hall and elephants woven on the upholstered seats; moccasins in the SubArctic display were embroidered with red and blue flowers; jewellery in the collections gallery was based on petals and stalks. Even the paper bag for my postcard was printed with ivy leaves. How deeply embedded and entwined we are with the natural world. The Nature of Things: Plants in Art Hastings Museum and Art Gallery, Johns Place, Bohemia Road, Hastings. Until 20 April 2014. Tel 01424 451052.